Note: You can enter this giveaway one (1) time per e-mail address per day. Deadline is 11:59PM ET 12.17.18. 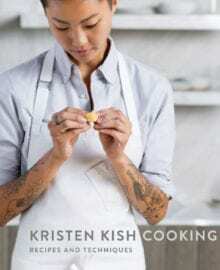 Meet Kristen Kish – one of the most exciting young chefs in America today. Her collection of more than 80 recipes are surprising yet refined, and use ingredients or techniques in a new way to create unique, irresistible dishes. She sears avocado and pairs it with brined shrimp, flavored with coriander and ginger. A broth laced with pancetta and parmesan is boosted with roasted mushrooms and farro for an earthy, soulful dish. These are dishes you’ll want to try making at home, just like this Brussels Sprouts Gratin — a cheesy cruciferous twist on standard gratins. NO PURCHASE NECESSARY TO ENTER OR WIN. Void where prohibited by law. Open to legal residents of the 50 U.S., D.C. and Canada (excluding Quebec) who are at least eighteen years old at the time of entry and have internet access. Begins on 11.26.18 at 12:00:00 a.m. ET and ends on 12.17.2018 at 11:59:59 p.m. ET. To enter this giveaway, submit your full name and email address on this form. Odds of winning this giveaway depend on the total number of eligible entries received. Only one (1) entry per email address per day. Sponsored by Leite’s Culinaria, Inc. For more information, visit our Official Rules. For a list of winners, check out our Very Happy Winners page. Be sure to add giveaways@leitesculinaria.com to ensure notification if you are the winner.